In the late 1800’s St. Croix Falls was undeniably a bustling river town. In fact, when the village was incorporated in 1888 a village hall was built on the 200 block of North Adams Street. The hall served as both a municipal government and social center of the community for many years and was utilized evenings and weekends for dances, concerts, commencement exercises, and gatherings of all kinds. As St. Croix Falls continued to grow citizens interested in cultural endeavors made a case for the construction of a municipal auditorium. Not long after the Standard Press ran a front-page notice of a “mass meeting to ascertain public sentiment in regard to building an Auditorium . . . to cost not less than $15,000,” the St. Croix Falls Village Board contracted architects from St. Paul to design the proposed structure. The citizen's dream of an Auditorium was finally coming to fruition and on October 22, 1915 the general contractor John F. Lindhart of Frederic was awarded the contract for the sum of $11,170. Swanson Brothers of St. Paul was awarded the heating contract at $1,314, and P.J. Aune of Milltown was awarded the plumbing contract for the sum of $365. general contractor to discuss and approve revisions to the plan which would cost an additional $5,400. Construction continued through most of 1916 and in January 1917, while World War I raged overseas, citizens of St. Croix Falls gathered to watch one of the top silent films of the era, The Battle Cry of Peace, in their new Auditorium. The vision by early residents of St. Croix Falls for the Auditorium was twofold. 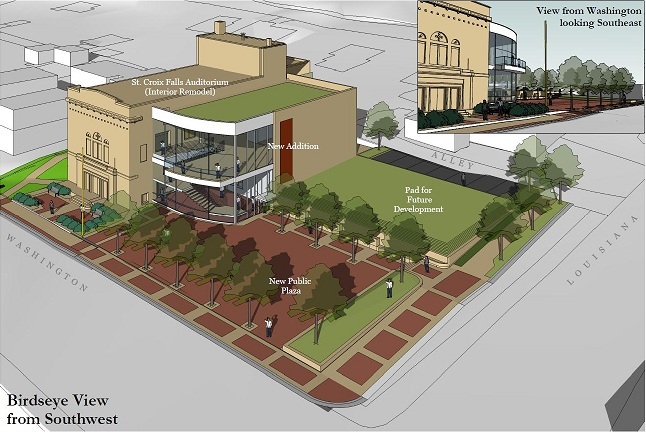 The 45’ by 95’ multi-level building had been planned to house a civic community center on the street level and upstairs, where they placed the stage, touring vaudeville shows and opera companies would perform. Unfortunately, live theatre would be decades in coming for the residents of this scenic river town for it seemed that St. Croix Falls was too far from the Twin Cities and its population too small for touring groups to anticipate financial success. Furthermore, World War I and the Spanish Flu undoubtedly made it difficult to promote public gatherings that relied on disposable income for entertainment. When it became clear that touring theatrical and opera companies were difficult to book into the upstairs portion of the Auditorium, the city contracted R.O. Pepper to relocate his movie business, Bide-A-Wee Motion Picture Theater, from the original village hall on Adams Street to the palatial Auditorium on North Washington. Built to seat over 400 on the main floor and surely another 100 or more in the balcony, the performance space of the Auditorium included a proscenium arch stage complete with a fly tower for easily moving back drops into place. When the movies came in, the original scenic opera drop (which doubled as a fire curtain) was flown up into the tower and forgotten. Painted in 1916 by Twin City Scenic Studio of Minneapolis, the drop was discovered in the summer of 1989 as the Friends of the Auditorium Theatre prepared the building for use in producing live theatre. Patrons to the Festival Theatre frequently have the opportunity to view this tremendous historical find as it has been used as the back drop for most Music Series performances starting in 2002. During the 1918 conversion to a movie house, the Auditorium’s balcony had to be altered to accommodate the new projection room. At the center of the lower half of the balcony, the original stepped floor was removed and the floor leveled. Due to potential fire hazards created by projection room technology of the era, the room was made non-combustible from the inside-out by adding a concrete floor finish on top of the existing wood floor and a skim coat of concrete finish to the walls and ceiling. Silent films ruled the days until 1928 when the “talkies” came into play. During the silent film era, local musicians (generally pianists or organists) were employed to provide live background music six days a week - but never on Sundays. Then, quite a stir occurred in the early 30’s when General Electric came to town with sound experts in tow. It was at that time that acoustical tiles were suspended from the original ceiling and added to the walls. In time, newly constructed public schools would provide space for ballgames and such, freeing up the street level of the Auditorium. The space did not stay dormant for long as it was leased to a variety of sewing factories. In the early 1970’s the street level of the multi-faceted building was remodeled yet again and the library and city offices called it home. Since 1994, when the new city hall was built, the library has occupied most of the first floor of the Auditorium, with Festival Theatre utilizing the very front for their central box office and public restrooms. In the spring of 1961 the St. Croix City Council contracted for the design and construction of a new entrance to the Auditorium, resulting in a twenty-two foot addition stretching to the sidewalk on the west side of the building. In order to accommodate the new entrance, the original central double doors and single doors on either side, along with ornamental brickwork, were removed. Also removed were the original check room, women’s room, ticket windows, and the first set of stairs with landings. When the movie theatre moved next door in 1985, the upstairs theater space went unused until The Friends of the Auditorium Theatre were issued a lease in 1989 by the city and then leveraged thousands of hours of volunteer work as well as thousands of dollars to begin the process of cleaning and redecorating the building. In 1990, Festival Theatre, an equity company, began producing theatre in the space originally created for that purpose. The residents of St. Croix Falls and surrounding communities now had the opportunity that the citizens of long ago only dreamed of. Today there are patrons of Festival Theatre who are children, grand-children and even great-grandchildren of the very same insightful citizens who first began this long journey of bringing live entertainment to the valley. With history as its guide, Festival Theatre has and continues to work closely with the city to continue renovations including major structural and mechanical efforts such as replacing the roof, dealing with electrical and air conditioning issues, and the dramatic removal of the 1961 lobby addition. 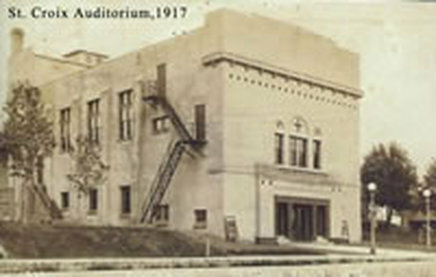 In October 2006 the building was named to the Wisconsin Register of Historic Places and in January 2007 the 90th anniversary of first opening to the public, the Auditorium was named to the National Register of Historic Places. In May 2007 the City of St. Croix Falls committed funds to complete a master plan for habilitating the historic structure and explore green alternatives for all aspects of renovation and future building operations. The master planning process, led by Claybaugh Preservation Architecture (Taylors Falls), will be completed by December 2007. Information gathered from St. Croix Tales and Trails by Rosemarie Vezina Braatz, the Historic Structures Report of the Historic Auditorium Theatre prepared by F.J. Sabongi, Historic Structures Specialist, and dozens of conversations with community members. In June 1990 Peter Vaughan of the Minneapolis Star-Tribune wrote, “a better name for the fledgling St.Croix Festival Theatre might be the Serendipity Playhouse.” Once you know the story behind the theatre you may be inclined to agree. Just four months prior to Vaughn writing his article, a young trio of theatre professionals had just discovered that their plans to launch a summer playhouse in Lake Geneva, Wisconsin had fallen through. A casual newspaper clipping about an historic theatre space being spruced up in a river town just 50 miles from the Twin Cities seemed a suitable substitute, and soon Carrie Classon-Smith as Artistic Director, Andrew Jensen as Business Manager, and Jason Smith as Technical Director arrived in St. Croix Falls to marshal support and enthusiasm for their dreams and successfully produced a rotating repertory that included The Show Off, Billy Bishop Goes to War, and School for Wives. The following year, 1990, St. Croix Festival Theatre was formally founded as a non-profit 501(c) (3) corporation to provide St. Croix Valley residents and visitors to this scenic region with highest quality of live professional theatre. In the years since, Festival Theatre has produced more than 100 plays for more than 200,000 St. Croix Valley residents and visitors. Were it not for Festival Theatre, many audience members would have an hour or more drive (each way) to the nearest professional theatre. Festival spent a few seasons producing theatre in Osceola’s ArtBarn, but returned to St. Croix Falls in 1996. As Classon-Smith, Jensen, and Smith moved into roles on the Board of Directors, James L. Walker and Marilyn Mays became Artistic Director and Business Manager in 1997, co-leading the theatre for two seasons. In 1999, Kate Riley and Pat Placzkowski were recruited from the Acting Company and led the theatre as co-Artistic Directors through the 2001 season. In 2002, Chris Reeder became the Artistic Director and served until 2005. Mark Baer joined Festival as Managing Director from 2003 to 2005. Danette Olsen served as Executive Director from February 2006 to January 2013. Pam Fuchs joined Festival's team as Business Manager in 2013. As Festival Theatre has grown over the past eighteen years, so has its commitment to the community. In 1998, Festival Theatre was named One of the Top Ten Theatres in America making a difference in their Community by Stage Directions magazine, a national trade journal. In March 2001, Festival Theatre was named Business of the Year by the St. Croix Falls Chamber of Commerce, in recognition of the theatre’s outreach programming and community involvement. Since 2001, the Student Matinee Series has served over 8,000 area students. Following severe back-to-back operating losses in 2004 and 2005, Festival’s Board of Directors reorganized with a transitional business plan and completed the 2006 season in the black and a record-setting holiday show, "Hans Brinker, or The Silver Skates." Danette Olsen was named Business Person of the Year by the St. Croix Falls Chamber of Commerce. Festival Theatre’s contribution to the community has also attracted and developed support from hundreds of local businesses in the form of in-kind donations, a growing subscriber base of nearly 1,000 individuals, and more than 100 dedicated volunteers who help out with various projects throughout the year. St. Croix Festival Theatre has truly become a community and cultural resource that makes a difference in the lives of people living in and visiting the St. Croix Valley. Festival Theatre welcomes talented and dedicated volunteers to help shape the future of our home - the St. Croix Civic Auditorium - and professional theatre in the St. Croix River Valley.